Exposed to unfixed light sources and seemingly still wet with the immediacy of dirty chemicals, a spread of corresponding prints are moving through time. Their time oscillates between the permanently recorded phantom objects, now married to the surface, and the urgent one-shot process of shadowy conception. Leeks of ghostly light crawled over fertile eggs and armies of seeds enveloping them in washes of cool greys, quartz pinks, and ponds of bleeding burgundies. In the swampy papers is a pregnant pause, a slowing down, an interruption of human time, and the welcoming of elongated geological time. 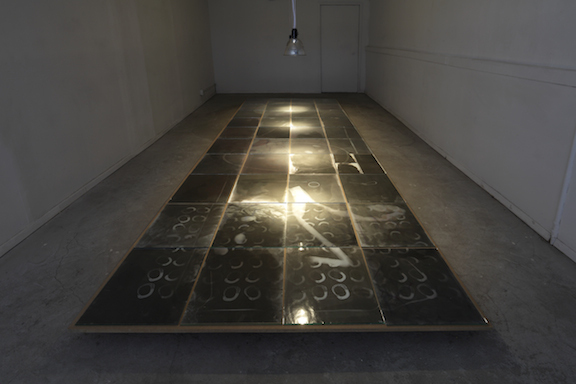 Amy Granat has held solo exhibitions with The Kitchen, New York; Galerie Eva Presenhuber,Zurich; Broadway 1602, New York, Nicole Klagsbrun, New York, Baisis, Frankfurt; andVidalCuglitta, Brussels. 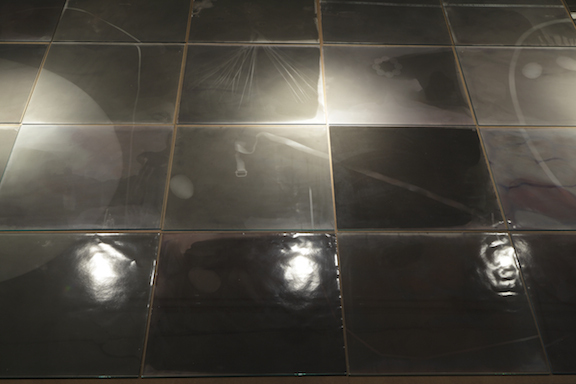 Her work has been included in group exhibitions at Centre Pompidou, Paris; The Palais de Tokyo, Paris; The New Museum, New York; Institute of Contemporary Art, London; Performa 11, New York; Blum & Poe, Los Angeles; and most recently The Material Images, curated by Deb Singer at Marianne Boesky Gallery, New York. Her work is held in the collections of the Museum of Modern Art, New York; the Whitney Museum of American Art, New York; the Fond National d’Art Contemorain, France; and the Musee de Beaux-Arts, La Chaud-de-Fonds, Switzerland. Fabian Marti has held one-person exhibitions with Kunstmuseum Winterthur, Switzerland; Kunstverein Braunschweig, Germany; Swiss Institute, New York; Centre Pasquart, Biel, Switzerland; Istituto Svizzero di Roma, Rome; Peter Kilchmann Gallery, Zurich; Galleria Fotni, Naples, Italy; Paradise Garage, Venice, CA and New Jerseyy, Basel. He has participated in group exhibitions with Martos Gallery, New York; Witte de With, Rotterdam; Migros Museum, Zurich; Museum Rietberg, Zurich; The Breeder, Monaco; Kunsthalle Wien, Vienna; Air de Paris, Paris; Museum für Gegenwartskunst, Basel; Museo d’Arte Moderna di Bologna, Bologna; Peep Hole, Milan; Kunsthalle Krems; and the the 54th Venice Biennale. His work is held in the collections of Kunsthaus Zürich, Zurich, Switzerland; Migros Museum Zurich, Switzerland; Parasol Unit Foundation for Contemporary Art, London, UK; Walter Bechtler Stiftung, Uster, Switzerland; Christian Boros, Berlin, Germany; Zabludowicz Collection, London, UK; Dumont Foundation, Arlington, USA; Credit Suisse, Zurich, Switzerland; UBS, Zurich, Switzerland; Deutsche Bank, Frankfurt, Germany.